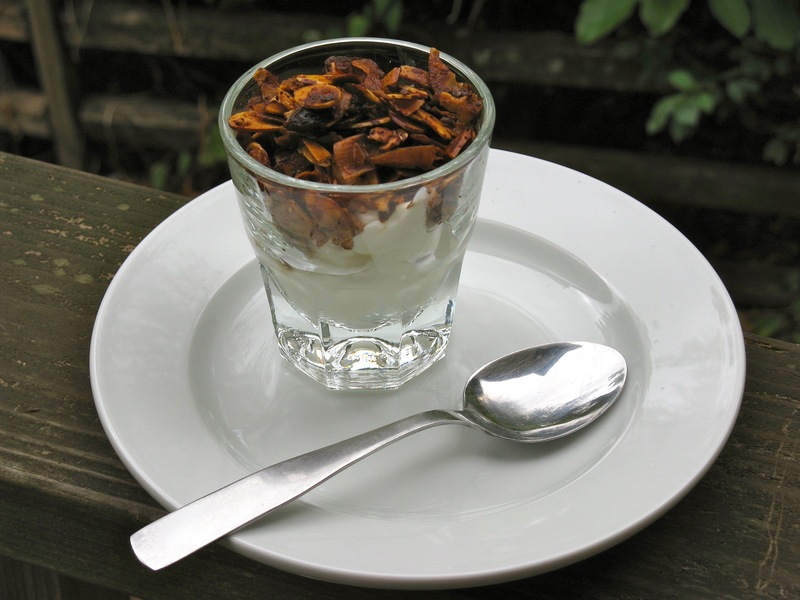 Spiced coconut almond granola. I swear this isn’t burnt! It got a little extra toasty, but I like it that way. Plus, the dates make it look darker. This coconut spice almond granola is incredibly addicting! It’s darn good, but hard to stop picking and nibbling at it. I guess that’s a sign of a successful granola recipe. This granola is especially delicious with the thick, half-and-half 24-hour yogurt (made with pasture raised half-and-half) that I have in my fridge right now. Each of these things is a treat on its own, but combined is even better. It’d be delicious with full-fat coconut milk as well or homemade nut milk. Granola mixture ready for the oven. 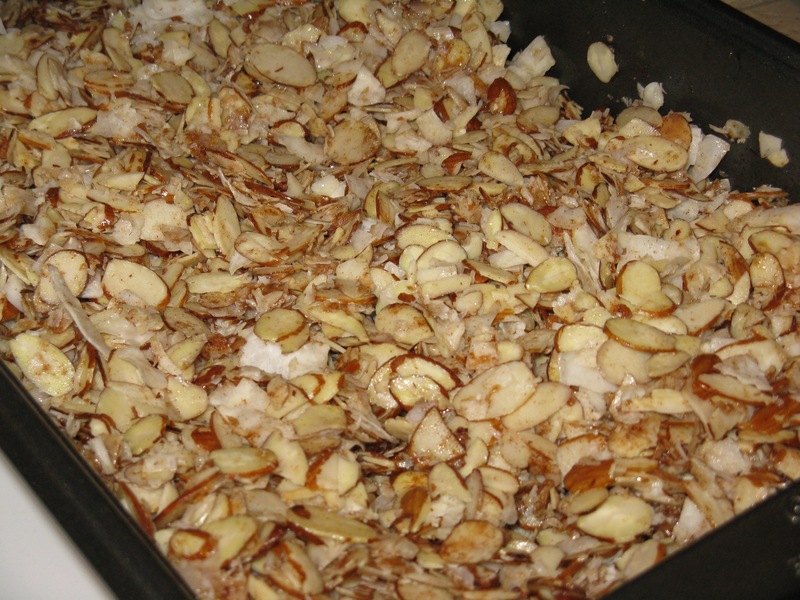 Mix almonds and coconut flakes together on a large baking sheet. In a small bowl, mix together the melted coconut oil, honey, vanilla, cinnamon, ginger and sea salt. Pour over almonds and coconut and mix well. Also, feel free to add more cinnamon or ginger if you want it spicier. Bake for 15 minutes. Then, mix the granola and bake for 10-15 minutes more or until mixture is golden brown. (Note: I let mine get a little extra toasty this time around, so it’s a little darker than golden!). Let granola cool a bit and then mix in the chopped dates. Gonna be makin this here treat. !!!!! It is REALLY good! Like I said, highly addictive! It looks scrumptious and I think the colors are gorgeous. Very Autumny! 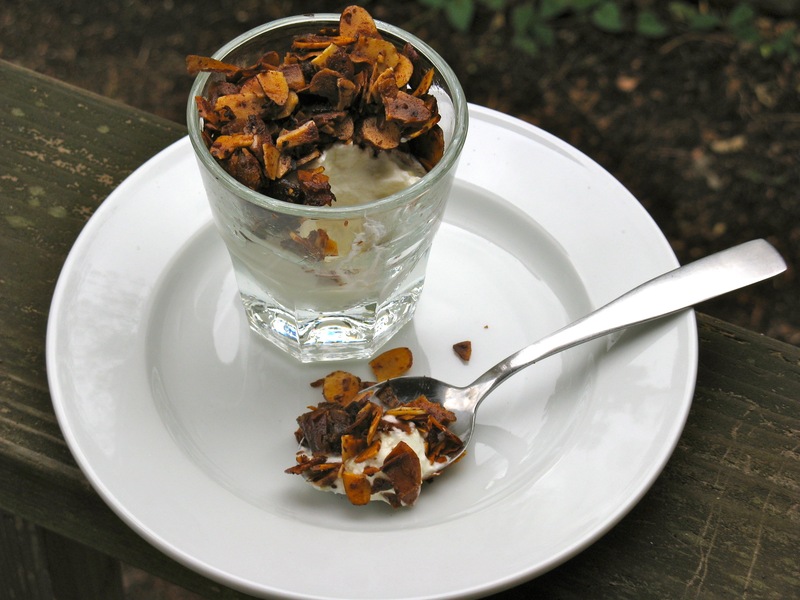 The granola alone sounds great but with the yogurt awesome, I have to give that a try!